General Assembly is proud to be partnering with Adobe in the development of the Adobe Digital Academy, a Bay Area–based program focused on offering opportunities in technology to underrepresented communities. Adobe supports high-potential candidates through partnership with General Assembly’s Opportunity Fund and Adobe technical internships. Selected candidates receive Opportunity Fund scholarships for General Assembly’s Web Development Immersive (WDI) course followed by a three-month technical internship in Adobe’s offices, with the goal of hiring interns for a full-time position. This entry was posted in #LifeAtGA, Social Impact and tagged Adobe, Adobe Digital Academy, career development, san francisco, Social Impact, web development on November 15, 2016 by Maxwell Zorick. This summer, we sent out an APB to find four talented women ready to join us in San Fransisco for a week-long exploration of the ever-changing world of tech. We set up exclusive company tours, one on ones with peer mentors, VIP conference passes, and lunch with leading women in Silicon Valley tech. Our hope is to inspire and empower these women to pursue their interests in technology, entrepreneurship, and innovation at its epicenter. Over 7,000 incredible women applied for this once-in-a-lifetime experience, and we’re thrilled to announce our winners! This entry was posted in Career Development and tagged san francisco, tech, women in tech, Women on the Rise on August 11, 2015 by General Assembly. Meet Leigh Nicholson, one of four Women on the Rise winners who will be flying to San Francisco this fall for a week-long educational journey! Leigh is completing her PhD in cellular and gynecological oncology at Sydney University, Australia. She is particularly interested in how technological and software advancements influence the future of biological research. To share her latest research, Leigh occasionally writes for publications about science and tech. Keep up with Leigh on Twitter and LinkedIn. This entry was posted in Business, Career Development and tagged Leigh Nicholson, san francisco, Startups & Entrepreneurship, Women on the Rise on August 10, 2015 by General Assembly. 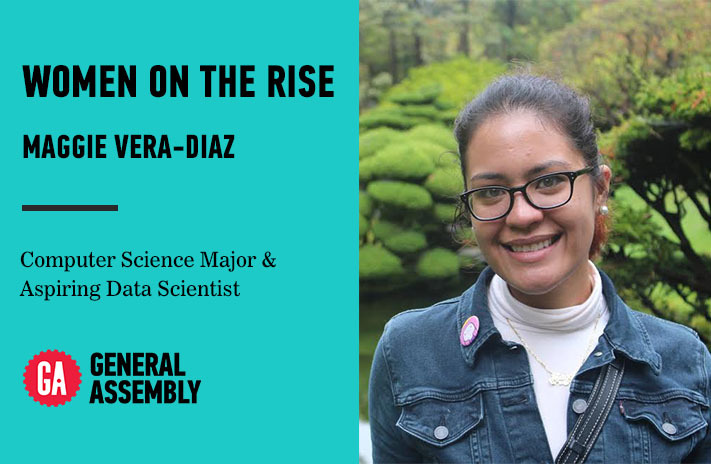 Meet Maggie Diaz-Vera, one of four Women on the Rise winners who will be flying to San Francisco this fall for a week-long educational journey! Maggie was born and raised in Miami, FL. Her interest in tech stems from playing Video Games with her brother as a child and learning how to mod gaming systems. Her professional experience is in online marketing, and she is currently studying Computer Science at Miami Dade College with the pursuit of a career in Data Science. Keep up with Maggie on Twitter or LinkedIn. This entry was posted in Data and tagged data science, san francisco, Women on the Rise on August 10, 2015 by General Assembly. Before Memorial Day, several of us from the GA team crammed onto a couch and talked about going west for the summer. Over the past two months, we’ve doled out no fewer than 300 *adorable* GA cookies, trekked what probably amounts to 50 miles of distance traveled from coffee shop to office to happy hour in various locations around SoMa, and most importantly, had the pleasure of introducing almost 1,000 students to General Assembly classes and workshops. This entry was posted in #LifeAtGA, Business, Coding and tagged general assembly, san francisco on August 29, 2012 by General Assembly.